The American South meets fast-food Tex-Mex in the soon-to-debut chicken-fried chalupa at Taco Bell, the newest way customers will be able to up the freak factor, calories and crunch. As far as when you can try it out, the company is considering dates to unleash it nationwide. 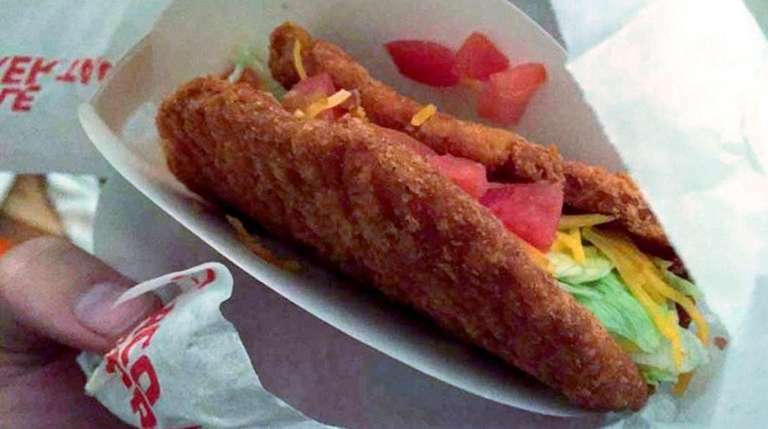 Taco Bell tested the fried chicken taco shell in Bakersfield, Calif. back in September, in what it was calling the “naked crispy chicken taco” with lettuce, cheddar and diced tomatoes. The chicken-fried teaser is on the heels of last week’s announcement that the company is going to roll out four versions of a cantina, each of which will debut in Orange County, Calif. this summer. Chicago and San Francisco saw the first cantinas in 2015. SEE PHOTOS Which chain stores do you wish would open in NYC? It’s fitting that the company’s test markets originate in California, since the first Taco Bell started in San Bernadino as a drive-in in 1946 and the company is based in Irvine. Today, there are over 350 franchisees overseeing over 6,000 restaurants across the United States.